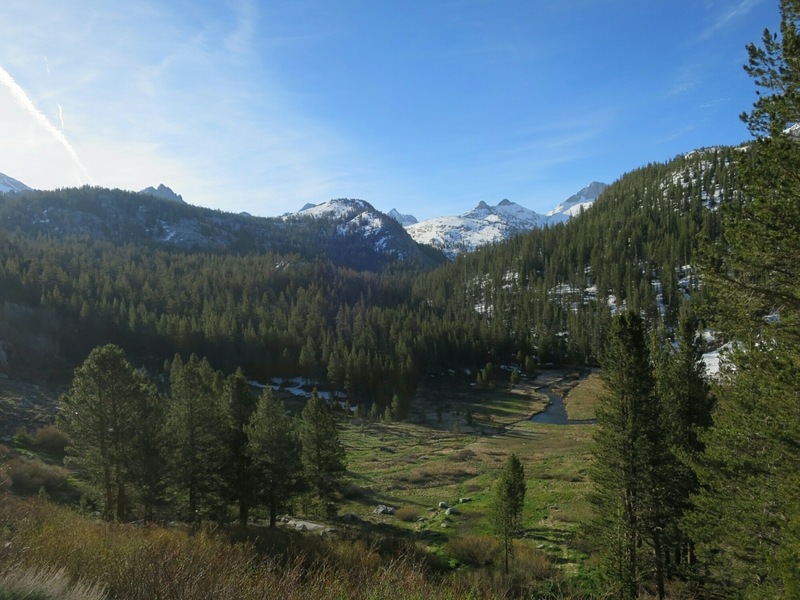 This morning on leaving camp, we chose to follow the PCT rather then the high snow alternative route along the Cascade Valley Trail. The trail for most of the morning was snow free on almost all sections that were exposed to the south. 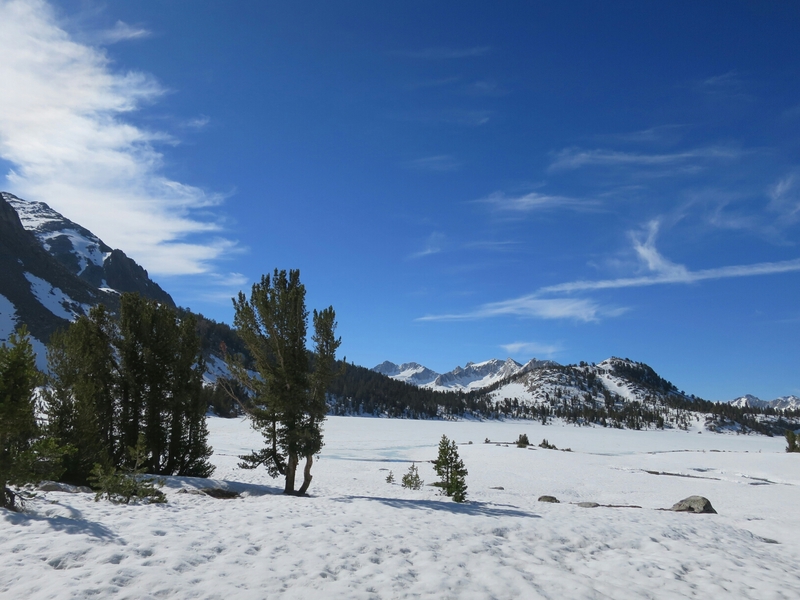 The north faces on the other hand were still covered in snow, which early in the morning was icy and hard to walk on. As we progressed we seem to have more and more snow. 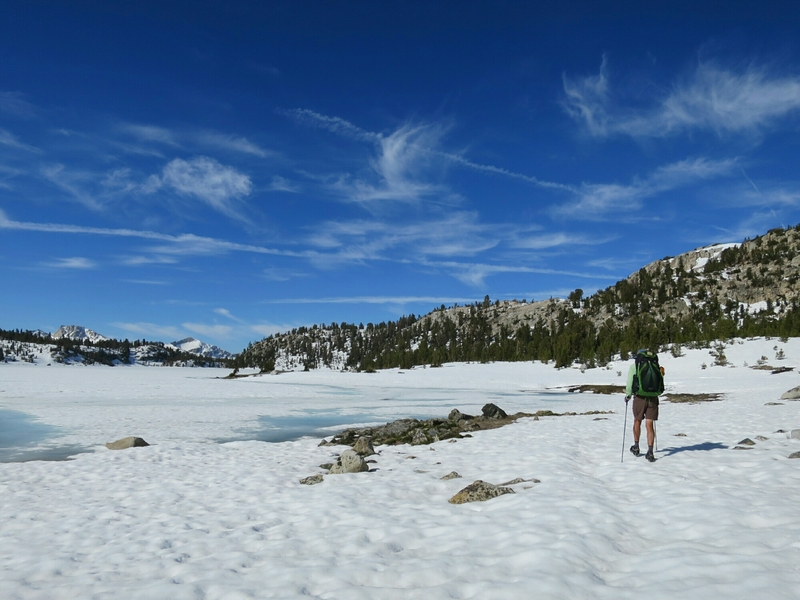 For much of our way to the Purple Lake outlet we hiked with our microspikes to help grip on the icy snow. 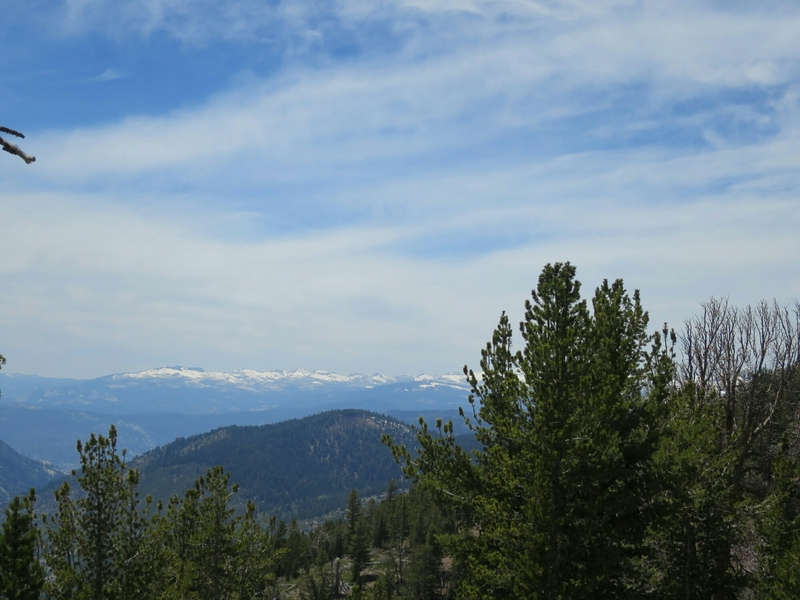 We stopped for lunch at a spot with a view towards what we thought was Yosemite. Just as we were waiting for the pot to boil another hiker came by southbound and stopped to chat. Turns out he hiked the PCT in 1977. This time he was doing a short section hike. 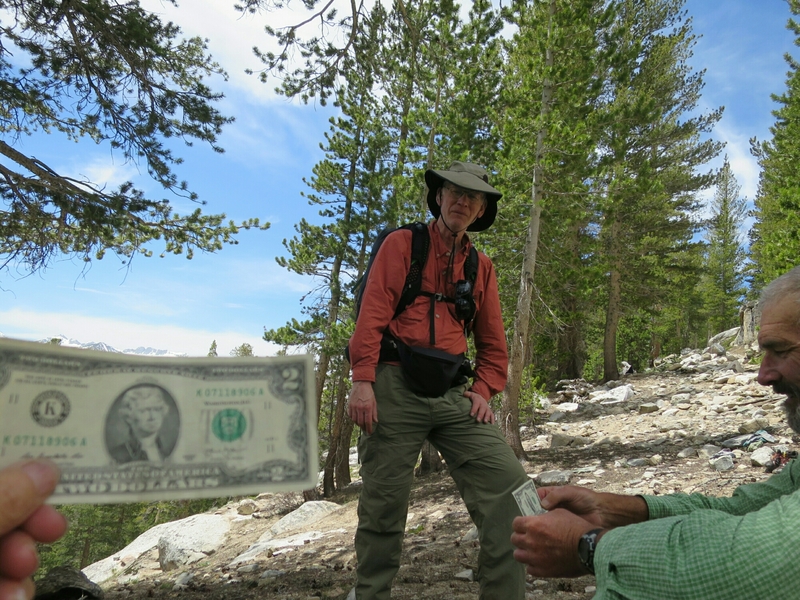 He handed us a $2 bill with well wishes for a good hike. I think he said it was his way of spreading trail magic. 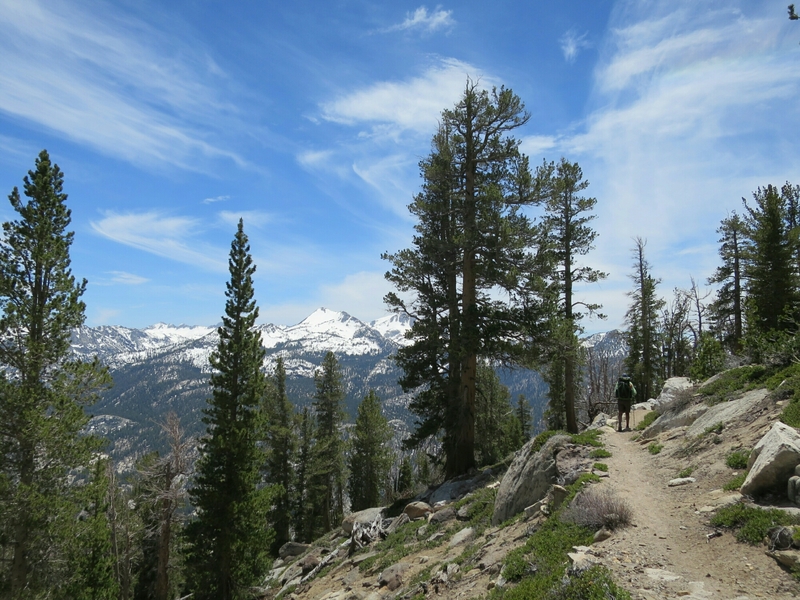 We were only the 5th through hikers he’d seen since leaving Tuolumne Meadows in Yosemite. How nice is that especially since I’ve never seen a US $2 bill. 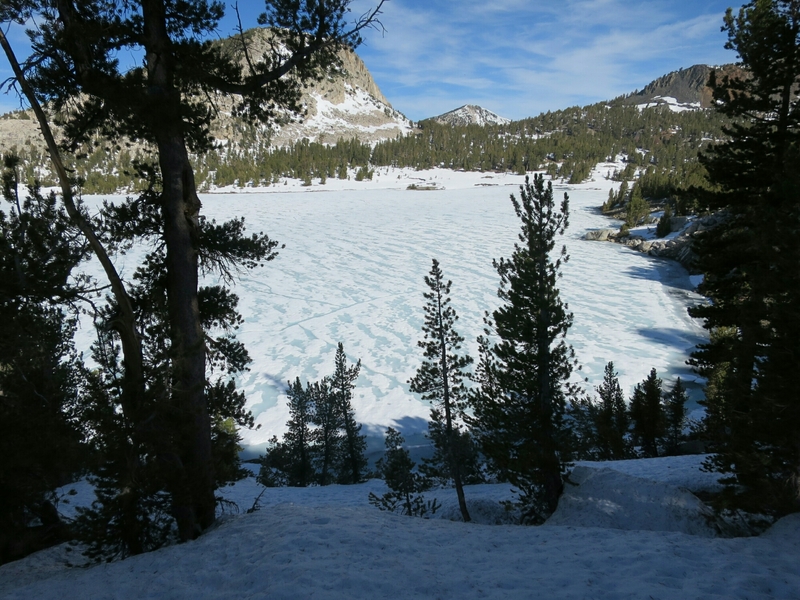 After lunch we hiked happily, and getting a little bit excited to reach Mammoth Lakes for another food resupply. Just before we reached Deer Creek we passed the 900 mile milestone. How quickly it seems to pass. Just after Deer Creek we found that we had phone reception. Great, we had arranged to contact Big Red (Rick) whom we met in Tehachapi to coordinate a ride into Mammoth Lakes. It seems that we were misinformed about the schedule of the shuttle bus from Red Meadow. It has not started running yet and won’t be for another couple of weeks. 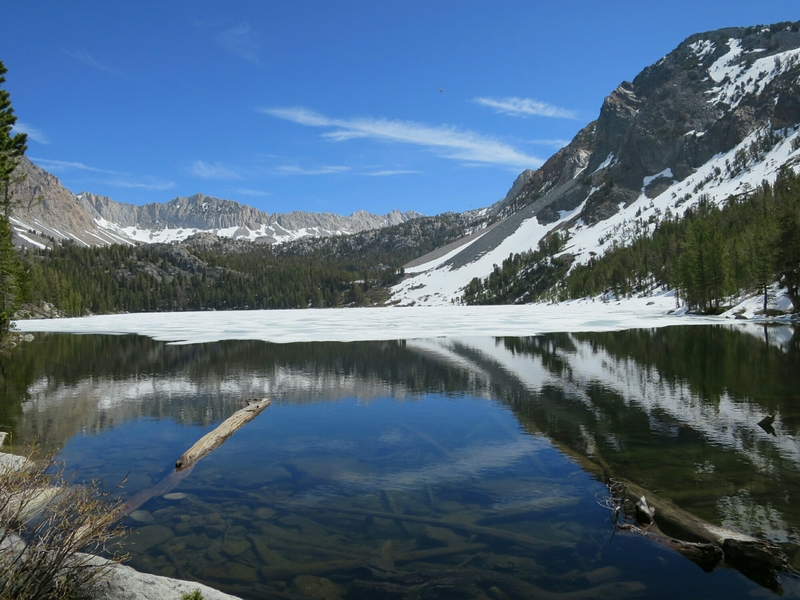 We spoke to Red and he advised getting off the PCT at Horseshoe Lake which we reach through the Mammoth Pass Trail. He would come and pick us up from there. We followed the Guthooks map to the trail junction and took the turnoff. This was another big mistake. 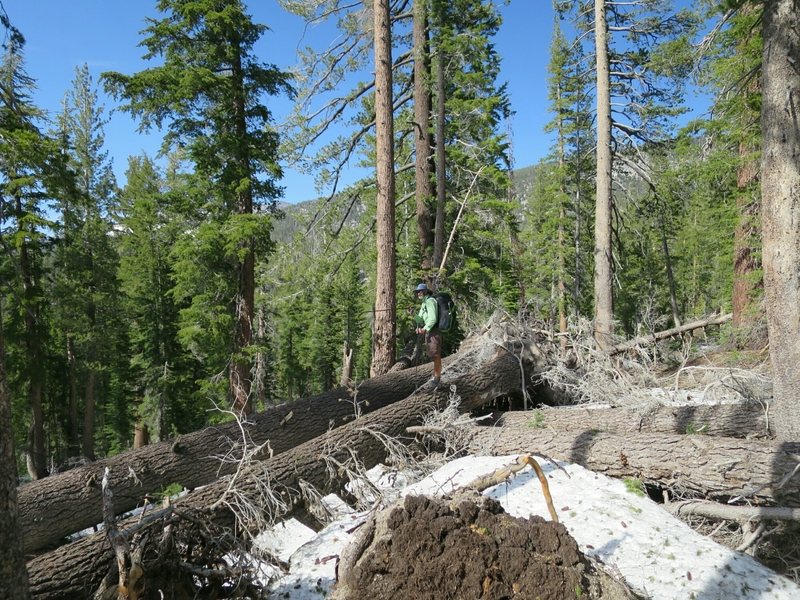 The trail that was indicated on Guthooks app was almost impenetrable with tonnes of fallen timber lining the trail. We persevered through this for a little while then realised that it was impossible and we turned back. 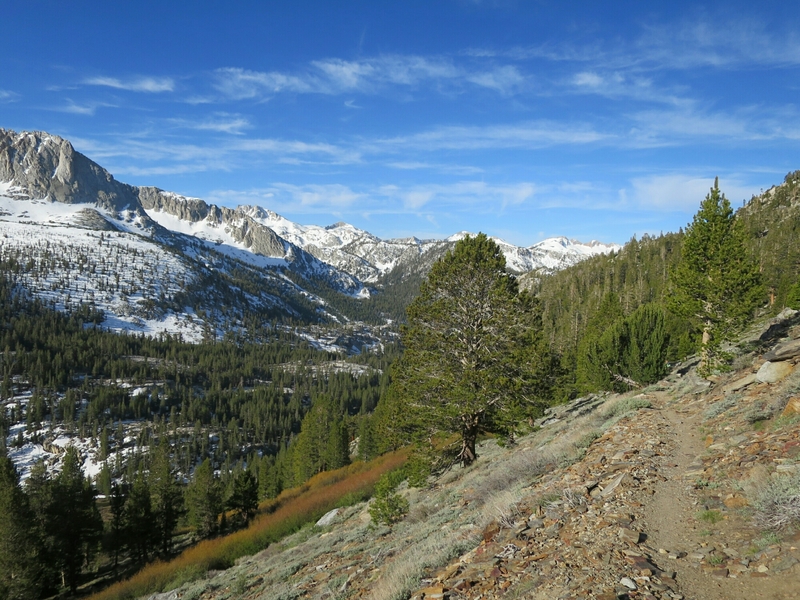 On the way back to where we left the PCT we found another trail junction to Mammoth Pass and after speaking to Red he said this was the right one. So we followed this much better trail untill we hit really deep snow. 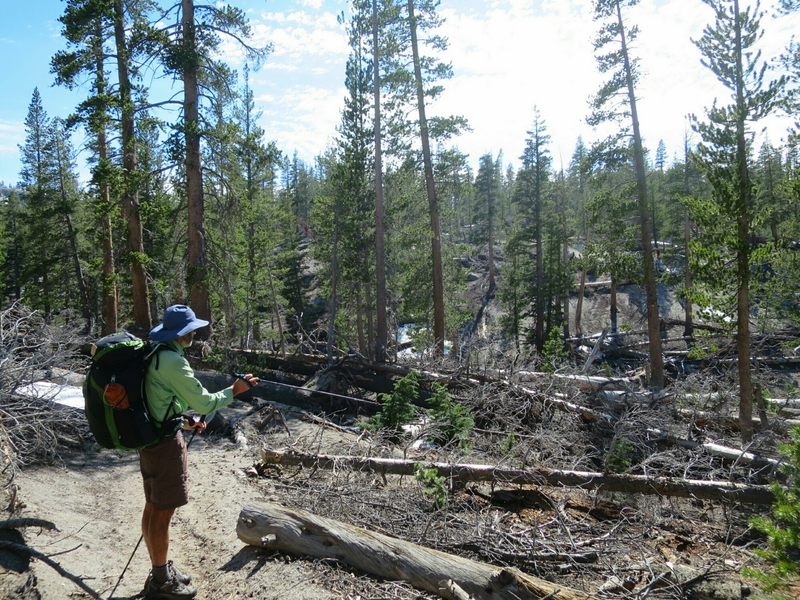 Without a map for this trail we had no way of navigating though the pass.Hammer was keen to just keep going. Not sure where, as the forest was littered with fallen timber and deep snow. I have to admit that at this point I cried. Light was fading and we were tired and deep in a forest full of snow and without a map. I begged Hammer to turn back which he reluctantly agreed to do. We had no phone service here so had to wait till we got to higher ground to ring Red and tell him we were going through to Red Meadow where we would camp for the night. It was awful to have put someone else out as Big Red was waiting for us at Horseshoe Lake. When we spoke to him, he insisted that we stay put he would come and get us. Without knowing how far it was we waited and eventually after some concern if being in the wrong spot we met. 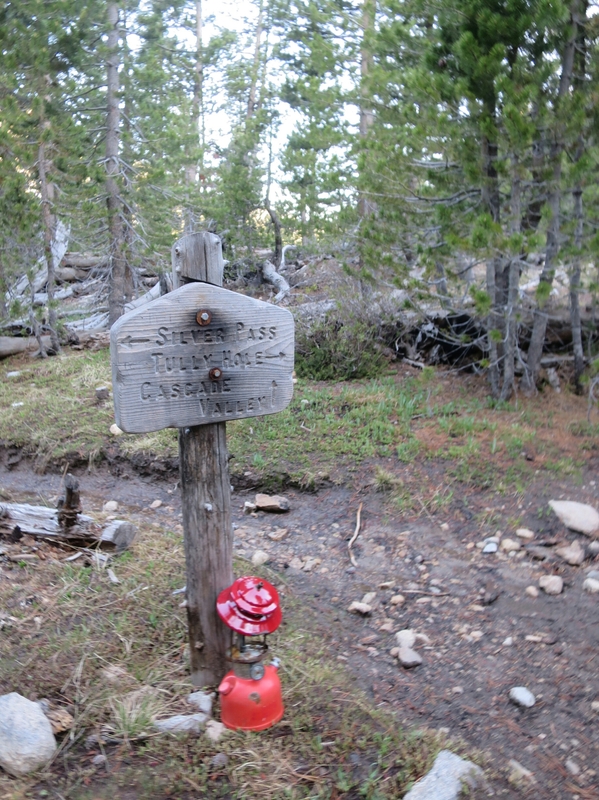 It turns out that the cleared trail to Mammoth Pass is not the one indicated on the Guthooks map but is just above the Crater Creek crossing. There was no trail junction sign here. We hiked with Big Red for well over an hour to get to the Lake and his car. What an amazing act of generosity. We could not be more grateful. 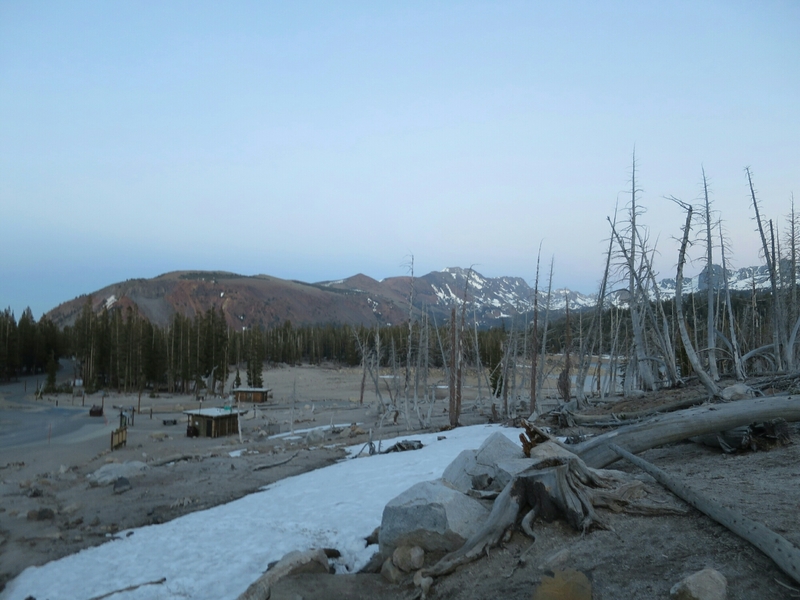 It was late when we got back into Mammoth. We stayed at Big Reds house where his lovely wife Linda cooked an amazing dinner. I can’t believe that we made it – with some extraordinary help. Dinner followed by a shower – we were ehausted and very quickly fell asleep in a super comfortable bed. I hope to actually get to meet you folks along the way. 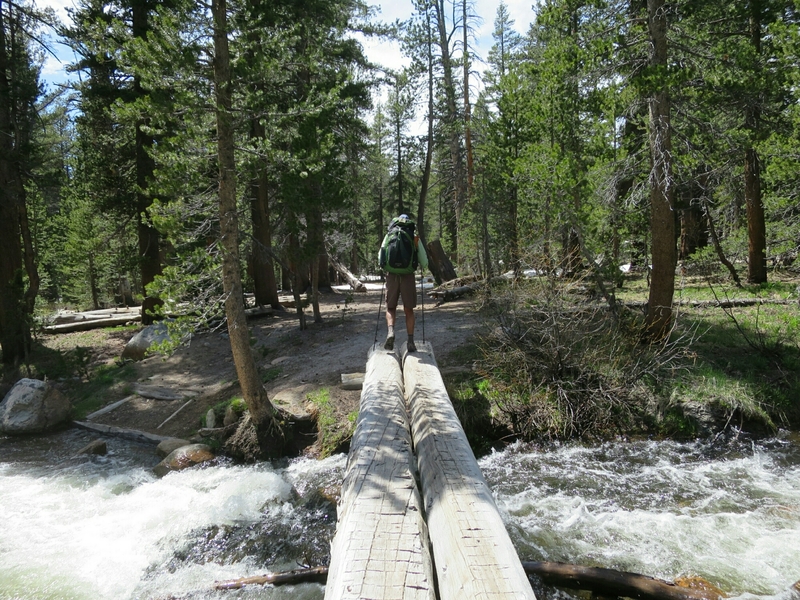 My other brother (Richard) and I are trying to coordinate a day or two hike along the way with Jim. 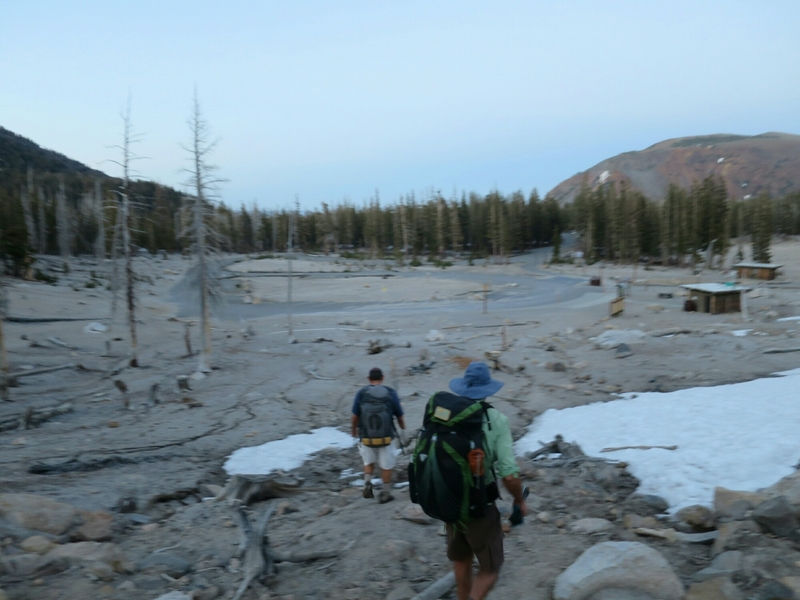 We are also trying to setup some trail magic for him to help get him through the stretch from Lassen (1353) to Etna (1606) … hoping we might be able to provide some to you folks along the way. Maybe a ice cold Fat Tire or two! Anyway, if there is anything I can help you with as you travel from Tahoe to the Mt Shasta, please let me know. I’ll do my best to get you supplies/information along the way if I can. Travel safe … looking forward to your next blog update. Great to to hear from you Michael and thank you for your kind words. 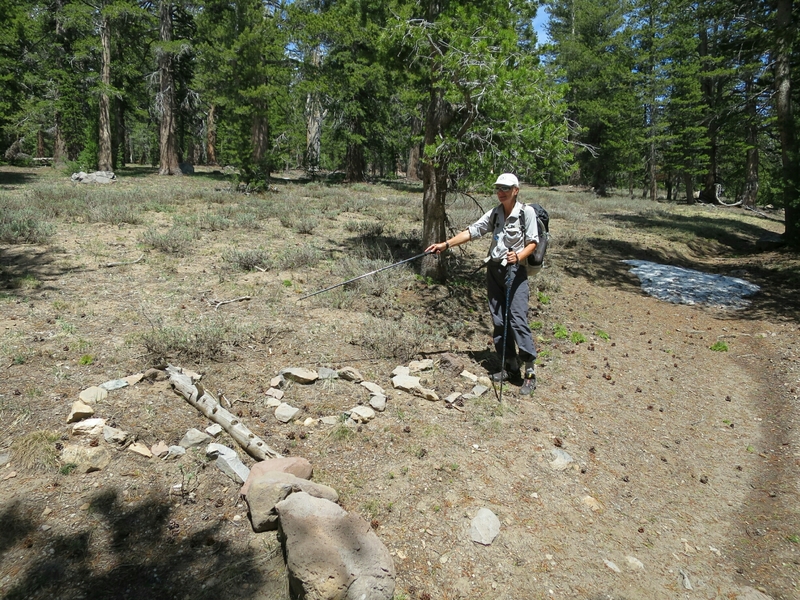 We had breakfast with Jim this morning as he headed to rejoin the trail at Lone Pine and we are headed out at Mammoth. 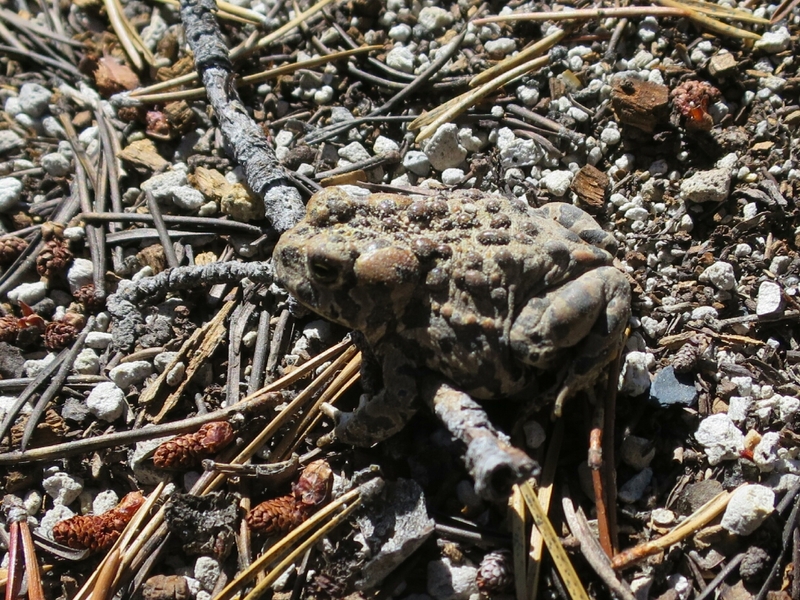 He was certainly looking forward to the family joining him on a part of the hike. I hope we do get to meet along the way. A Fat Tire would be a real treat by the time we reach Mt Lessen. I can feel your distress at the end of the day, so glad you got out safely. Stay tough I know you both have amazing mental toughness. Thank you Clare, it was a trying finish to the day.